No one likes to be dealt a pair of pocket aces, only to lose the hand in a showdown. EuroLinx Poker Room (eurolinx.com) knows that pain and is offering “humanitarian aid” to suffering poker players. From now on, any player that loses a hand with a pair of pocket aces will get whatever they had in the pot refunded (maximum €25). 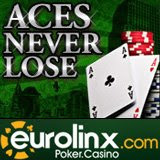 Full details of the Aces Never Lose refund offer is available at: http://www.eurolinx.com/en/Poker/Promotions/AcesNeverLose.aspx. But the humanitarian aid doesn’t end there. EuroLinx.com also has a Bad Beat Jackpot to help out players dealt hands that really don’t deserve to lose. Any player that loses with four-of-a-kind eights or better gets half the Bad Beat Jackpot, which is currently nearly $80,000. 25% goes to the winner of the hand and the other 25% is split between the other players who actively participated in the hand. The Linx Media group operates three online gaming sites featuring products and jackpots from Microgaming: Eurolinx, BetOnBet, and LinxCasino. They offer more than 400 games and give players a chance at some of the biggest jackpots on the internet, including the Mega Moolah jackpot that was recently hit for more than $6 Million and is currently just over $1.1 Million. The total Microgaming jackpot pool at Eurolinx, BetOnBet, and LinxCasino, is over $2.5 million. Linx Group online casinos offer the excitement and dependability of Microgaming casino games with more bonus money than any other Microgaming casino. There are no wagering requirements for Linx loyalty points, so players can cash them in whenever they like.